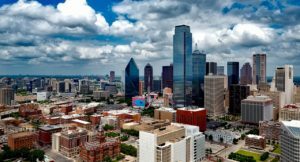 While Fort Worth is famous for its western culture and Dallas more urban, there’s much more to the DFW Metroplex than meets the eye. As with most large cities, there are a myriad of little treasures that are hidden off the beaten path, and which can often take years to discover even if you’re a local. We’ve put together a list of our top ten favorite quirky things to do around the DFW area to give you a head start. To visit them all, you’ll just need a bit of time, so come stay awhile. Klyde Warren Park is in the center of Dallas, within walking distance of many of its most famous landmarks, such as the Dallas Museum of Art and Dallas World Aquarium. Amid so many world-renowned tourist attractions, it’s easy to overlook this 5.2 acre park, but it’s well worth your time. The park’s ingenious design alone should be enough to attract visitors, as it is an urban green space built over a freeway in order to maximize space for outdoor recreation in the city center. There is also daily free programming for any who happen to meander into to grounds, including yoga, lecture series and outdoor concerts and films. Located in Arlington, the Top O’Hill Terrace is a reminder of the excesses brought on by prohibition in the 1920s and 30s. Fred and Mary Browning bought the property in the late 1920s and quickly converted it into a casino and brothel, complete with an escape tunnel and hiding room for gambling paraphernalia and booze during raids. Today, visitors can see many of the original structures and get a deeper glimpse into its history with a guided tour. The Cowgirl Museum and Hall of Fame’s mission is to “honor and celebrate women, past and present, whose lives exemplify the courage, resilience and independence that helped shape the American West, and foster an appreciation of the ideals and spirit of self-reliance they inspire.” Some of the most notable women honored include: Sandra Day O’Connor, Patsy Cline and Laura Bush. Housed in the Fort Worth Stockyards, the Palace Light Bulb is the second longest burning light bulb in history. The bulb was screwed in at the Byers Opera House in Fort Worth on September 21, 1908 and has been burning ever since. Now with its own Facebook page, potential visitors and those interested in the bulb’s longevity can check its status to make sure it’s still lighting up the dark. The Adrian E. Flatt, M.D., Hand Collection, housed at the Baylor University Medical Center, was created by an orthopedic surgeon of the same name who specializes in hand surgery. In the 1950s, Flatt began taking hand casts of patients’ hands in order to prepare for surgeries, and from there became fascinated with the uniqueness of every set of hands. In his growing enthusiasm for these plaster molds, he began to pursue the mitts of America’s household names. Soon, he had brass models from Walt Disney, Dwight Eisenhower, Mickey Mantle and Doctor Seuss. The collection has grown, and now contains over 100 brass casts of famous hands. Located near the Fort Worth Convention Center, the Fort Worth Water Gardens are a sight for sore eyes on a hot Texas day. Built in 1975, the fountains were designed by Philip Johnson to include three pools of water: the aerating pool, the quiet pool and the active pool, with water tumbling down a series of terraces into a small pit. One of the lesser known art museums in Dallas, the Geometric Madi Museum is the first permanent museum dedicated to the specific artistic movement. The Madi movement was founded by Argentinian artist and poet, Carmelo Arden Quin, in the 1940s. Texans Bill and Dorothy Masterson became fascinated with the movement over a decade ago, and decided to give back to the community by sharing their collection of Madi artwork. These are just a few of off-beat, quirky things Dallas-Fort Worth has to offer. The next time you’re in the DFW area, make sure you visit one of these seven spots to truly experience the depth of what our cities have to offer. And, if you decide you’d like to stay, contact us anytime for information on Dallas-Fort Worth real estate.